Anyone who maintains their passion for off-road excitement at the highest levels knows that California has a wealth of trails that can be scenic, challenging, or offer the epitome of off-road extremes. While there are more trails than one can easily tackle in one trip, there are some that enjoy nationwide acclaim. Below, you will find the best off-road trails in California that draw in ATVs, truckers, and jeep owners from far and wide. Pack up the gear and get ready to ride these stunning trails. This area offers 68 miles of marked and rated trails that are appropriate for riders and off-roaders of all skill levels. There are a wide variety of terrains that extend along the trails, ranging from hard-packed stretches to sandy washes that challenge your capabilities. The trails feature stunning views that edge steep ridge lines. Off-roaders will need to acquire an Adventure Pass in order to gain access to the trails and camping area. However, these national forest trails located in Cuyama, CA are second to none. Located only minutes outside of San Diego in Ramona, this privately-owned area has been open for business for over 35 years. Camping is permitted in the area, and a seasonal stream runs through the terrain, offering additional challenges to anyone making their way to this course. The majority of visitors stay at least two days in order to explore everything that this location has to offer. This desert retreat has the best of both worlds to offer to off-roading junkies. There are over six miles of ATV trails in addition to 62 miles of 4×4 trails to keep riders exploring. The majority of trails are composed of dusty and rough terrain that create unpredictable surfaces. However, the Joshua Tree Trail is one path that is smooth and fast, running over many different-sized berms. Located in Big Bear City, this area is an open trail that requires a pass in order to gain access. Passes can be obtained from local rangers or from the Lucerne Valley Market. Camping is permitted, and there are amenities available to riders in the more remote parts of this location. Trails for both novices and the moderately experienced can be found in the eastern part of the Sequoia National Forest. 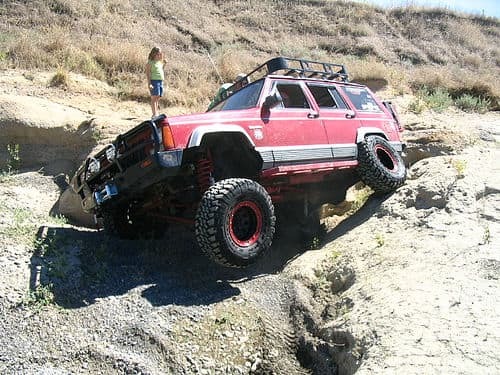 Among the most loved areas at this location are the sand pit and Buck Rock Jeep Trail. The scenery also offers panoramic views of surrounding mountains that stretch along King’s River and Jennie Lakes Wilderness.